Bertken de Leede is the business advisor of January for the Small Farmers, Big Deal Campaign! She explains why the underdeveloped agricultural sector in Nepal is an opportunity, not a problem. Bertken: “When people are interested in doing business in Nepal, they always ask me about the 2015 earthquake. In April of that year an earthquake with a magnitude of 8 on the richter’s scale shook the center of the country. 9,000 people lost their lives and over 22,000 were injured. The damage was estimated at 10 billion USD, so it had a huge effect on the country. However, there were also big parts of the country where the earthquake barely registered or caused damage, so it really depends on the region. “Export of high valuable commodities is possible but can be quite difficult because Nepal is a landlocked country. Commodities have to be transported by plane or they have to be shipped via India. This means that exporting products is relatively expensive. The certification industry also hasn’t taken off yet; there are almost no companies involved with certification. We had to fly people in from India to get the proper certification for organic farming, for instance. That is costly, and farms are small, so the relative investment is high. Track and trace and food quality/safety is also a major issue. But Nepal remains a very interesting country to source agricultural products from because it is very versatile and undiscovered. The geography is diverse, from snowy mountains to tropical lowlands, you can almost find any commodity you want in Nepal. Think about herbs like cardamom, ginger or turmeric, tea and coffee, but also fruits like oranges, papayas, kiwis etc. We are actively supporting the tea sector and vegetables/fruits. But we are also engaged in improving the dairy sector. Dairy consumption in Asia is rapidly increasing. The milk yield per animal is still quite low in Nepal so we hope to support in improving productivity per animal. Agriterra is well positioned to do so because of our network of dairy related agripoolers in the Netherlands which have a lot of expertise in the dairy sector. Several experts from Friesland Campina have provided technical assistance to dairy cooperatives since 2015. 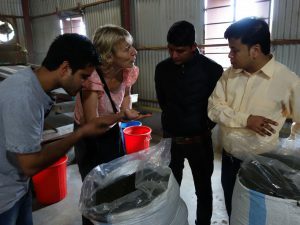 Agriterra is currently expanding its activities in Nepal because we see an agricultural sector with the potential to be built from the ground up in a sustainable and social way. Companies that are interested to do business or CSR in Nepal are most welcome to contact us: we can mobilize our network; support in identifying opportunities/matchmaking; and know how to deal with cultural differences. Last week, Bertken shared with us how in the food sector sustainability programs can lead to rock solid profits. The week before, Bertken explained why advice and training is often more important for development of local cooperatives than development aid.